We're settling in for the sixth of six fabulous nights here at Clinton Lake. It's been a wonderful visit. 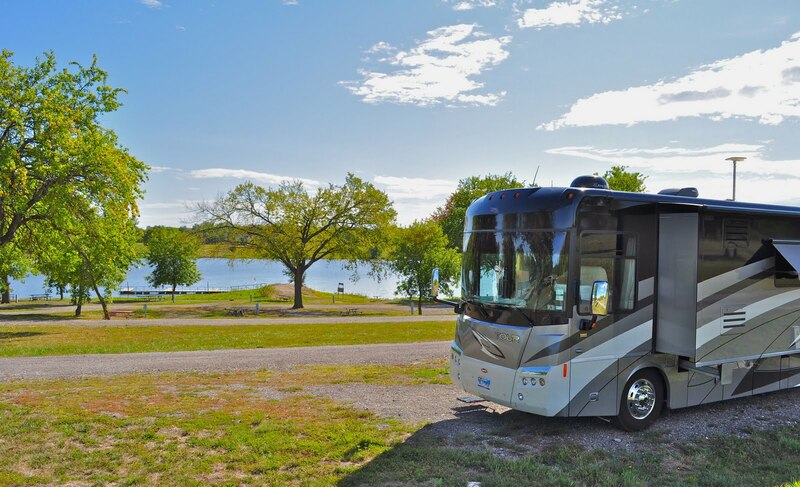 The weather has been stellar, and our campground just can't be beat. This is a look at our first site, a 50 amp full-hookup pull-through in the Cedar Creek Campground. Clinton Lake is yet another Corps of Engineers lake close to our old home town. The Corps operates five campgrounds around the lake. 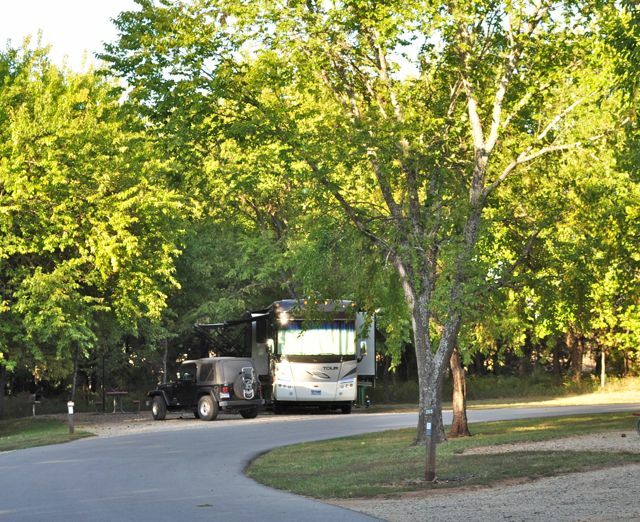 Two other campgrounds are located in the state park on the north side. With so many choices, you really can't go wrong finding a place to camp here. 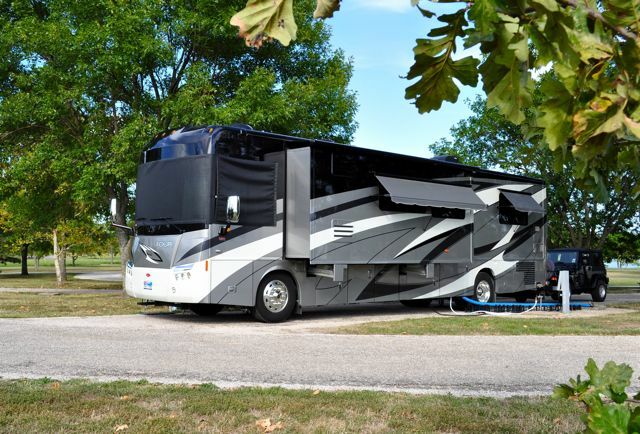 But, the Corps campgrounds are our favorite. We liked them so much we tried out two during our stay. Long before this beautiful lake existed, the Wakarusa Valley was home to the towns of Sigil, Belvoir and Bloomington. 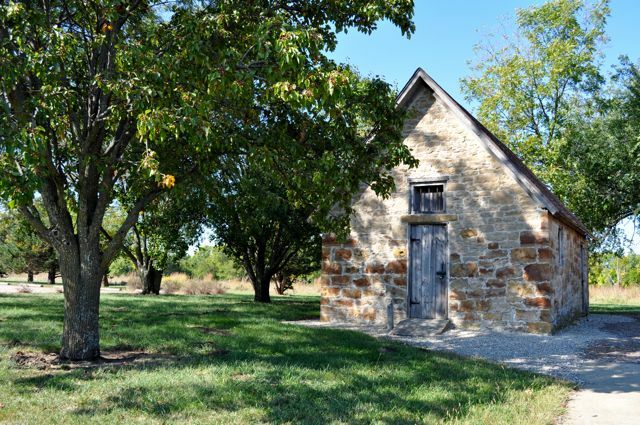 A small piece of Bloomington history remains in this historic smokehouse that stands between the Hickory and Walnut Campgrounds in the aptly named Bloomington Park area of Clinton Lake. 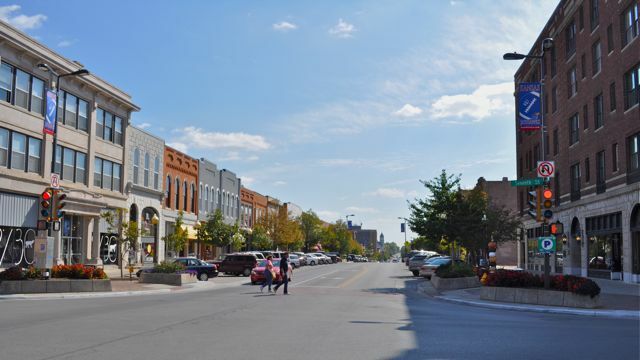 Over time, Bloomington changed its name to Clinton, which is now a place some 500 people call home in this small town adjacent to the lake. 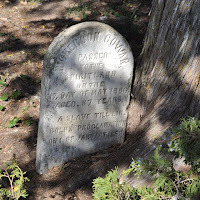 In the 1850s, the people of Bloomington helped slaves escape through the Underground Railroad. Evidence of this important piece of history exists in the Clinton Cemetery, which is one of the oldest burial grounds in Douglas County. While searching for a geocache in the area, we spotted this headstone of a former slave. 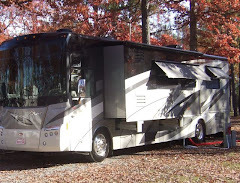 We split our stay here between sites in two campgrounds. After spending three nights with all the "luxuries" Cedar Creek had to offer, we decided to "rough it" with a 30 amp and water back-in at nearby Walnut Campground. This campground closes September 30th, so we practically had the place to ourselves. We loved it! 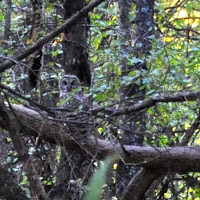 Our site faces a treed area that houses all kinds of Kansas wildlife. 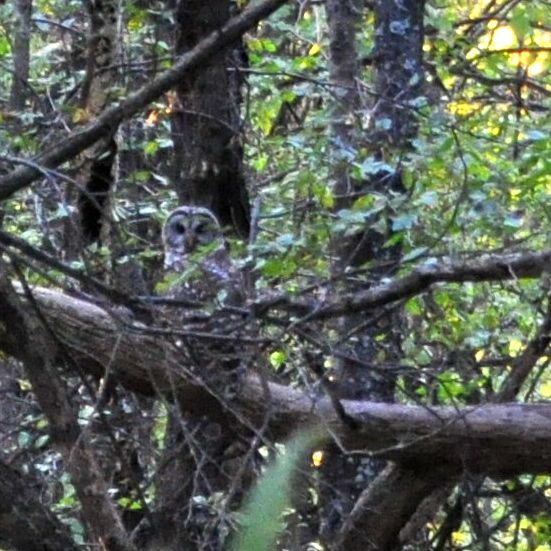 The other night I followed the hoot of an owl and went looking for him. If you look ever so closely on this picture (click on it to enlarge), you'll see the well-camouflaged but very cute little guy. Well, it's just about cocktail hour around here, so we'll close. We'll check in again soon from Kansas City. 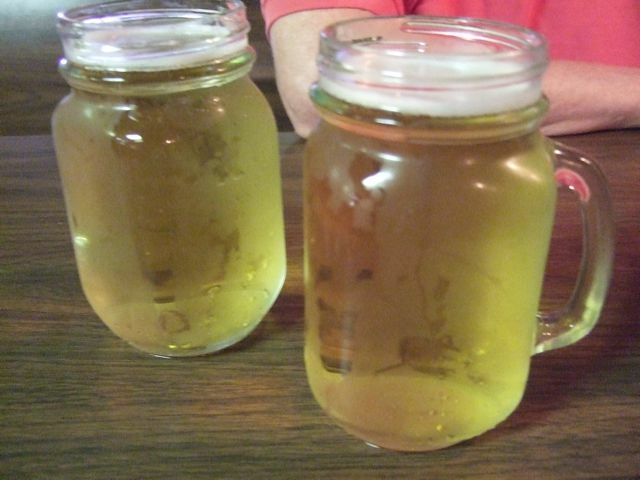 But, right now all we can say from here in these peaceful environs of eastern Kansas is....Cheers! One of the reasons we've stopped at Clinton Lake for a few days is to explore one of our absolutely favorite towns: nearby Lawrence. Our first stop, shortly after our arrival, was the local Walmart for provisions. We chuckled when we wheeled our cart down this aisle. If you don't know what Lawrence is home to, this is a big hint. 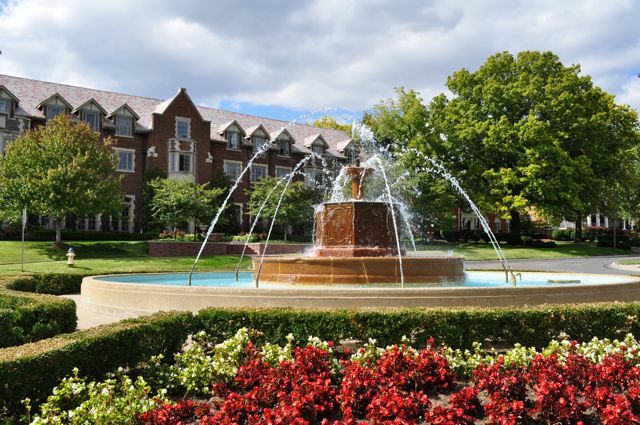 On this absolutely glorious Sunday afternoon, we enjoyed a leisurely stroll across our favorite university campus, which just so happens to be in this favorite town of ours. 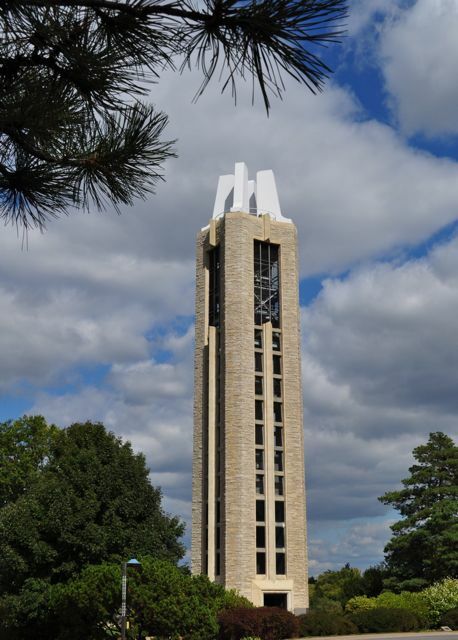 The University of Kansas Campanile and Carillon is the most familiar landmark on campus. Since its construction in 1950, new graduates have started their commencement by walking through the campanile and down Mt. Oread to the football stadium. Although it's been decades since we made our graduation walk, it's always a treat to visit this stately tower. 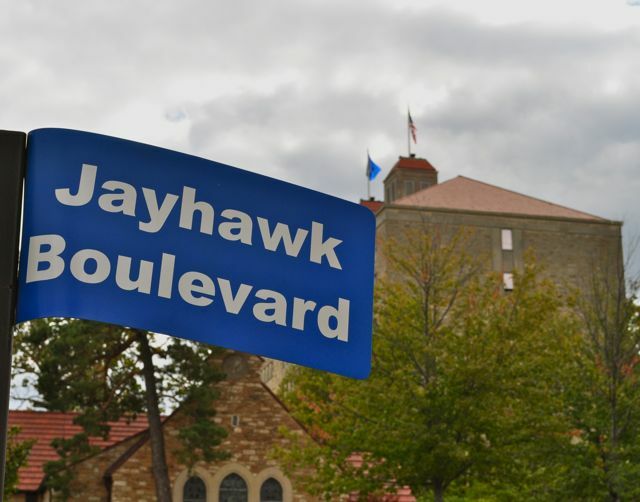 Our stroll down Jayhawk Boulevard, which runs through the middle of the main campus, brought back many collegiate memories for us both. Things were pretty quiet around here today. But, it was all beautiful. 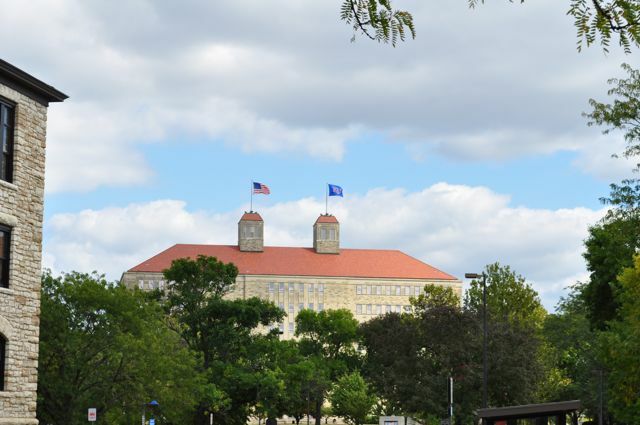 Fraser Hall stands far above the center of campus with its twin flags flying. This landmark can be seen for miles outside Lawrence. 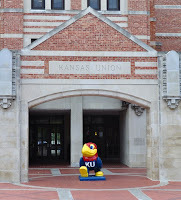 Even though it was a zillion years ago, I can still remember spotting Fraser on the drive when my family brought me to KU to start my Freshman year. 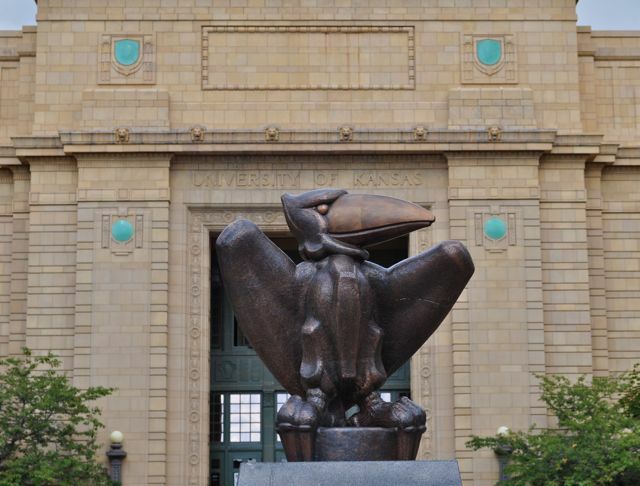 The University of Kansas is home to the Jayhawk, a mythical bird with an interesting history. There are several of these icons along the campus road that bears its name. 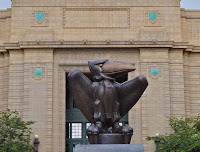 This statuesque Jayhawk stands in front of Strong Hall. This colorful Jayhawk welcoming visitors to the Union looks more like the Jayhawk we know and love. As graduates of the William Allen White School of Journalism, we've both spent many hours in this building. Many years ago, within these native limestone walls, I honed my blogging skills! One of my favorite buildings on campus is Spooner Hall, which is also one of the oldest. 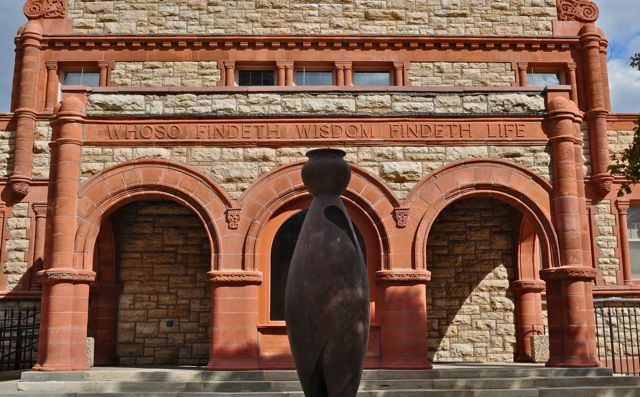 The inscription over the portico provides inspiring words for students (and long ago graduates). 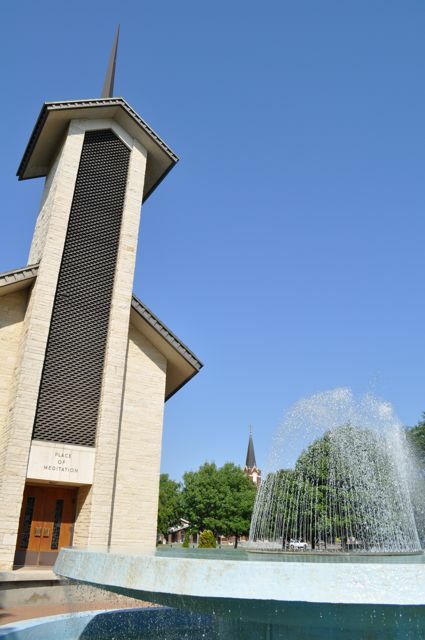 Danforth Chapel is a beautiful and peaceful spot on campus. 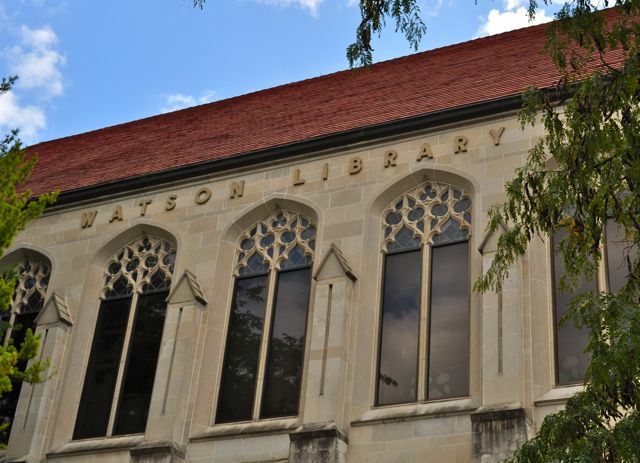 Many students, including the one of us who didn't spend much time in the library (and is the principal author of this blog), have been known to stop inside for a moment on the way to a final exam. 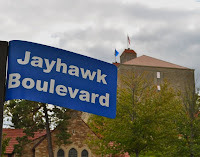 We continued our long walk down memory lane with a quick trip to downtown Lawrence. As we traveled the center of downtown along Massachusetts Street, we recalled the location of restaurants and nightspots we frequented when we were students. Surprisingly, a couple of places are still thriving today. We're so enjoying this visit to our old college town. It's nice to be back. We're biased, of course. But, if you're passing through Kansas, Lawrence is a "must stop". 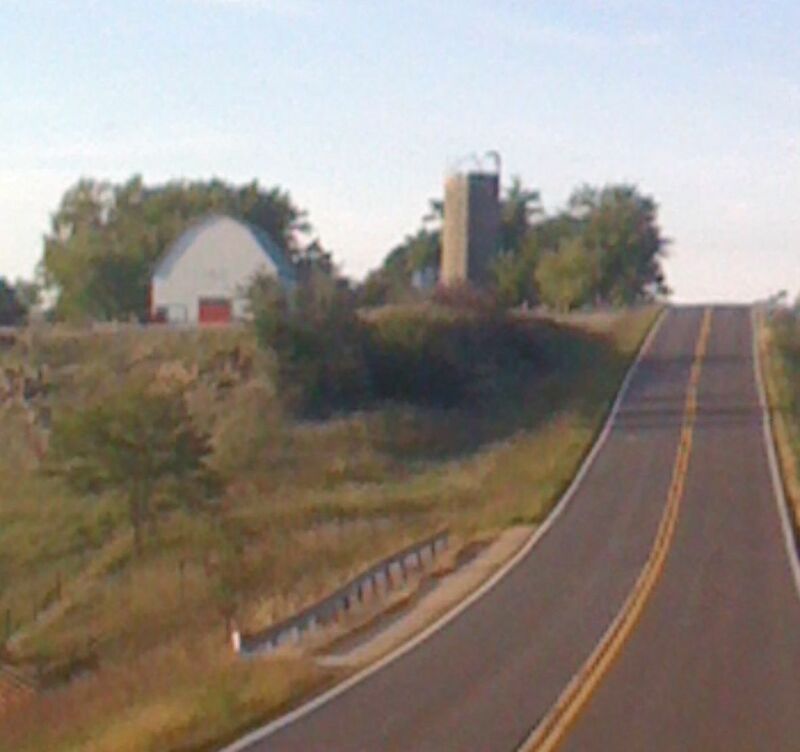 This is State Highway 68, which runs east and west just north of Paola, Kansas. We're sharing this picture because we've spent more time on this road over the last couple weeks than any other. We've traveled this route to make three (count 'em, three) stops in Paola during that time. 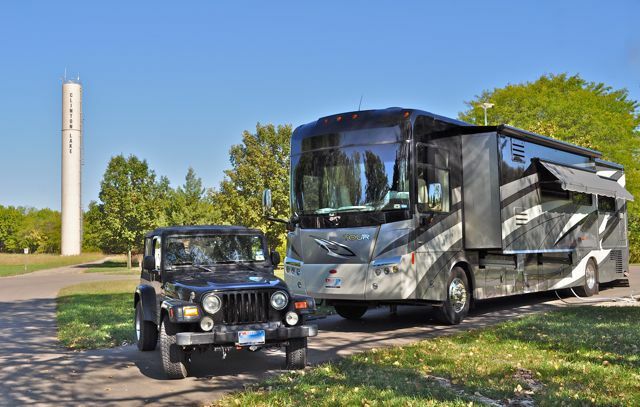 Paola is home to approximately 5,000 Kansans and our favorite and most trusted RV repair folks, A-Z Mobile RV Repair. 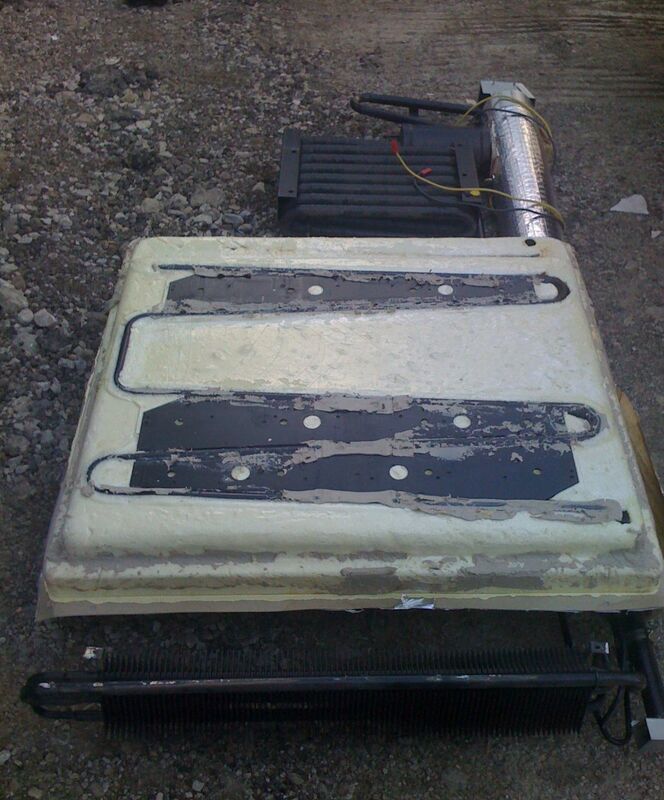 We stopped by A-Z two weeks ago to take care of the problem with our air conditioner. They made super quick work of that job, so we filled our new-found free days with a quick trip to Lake Melvern. 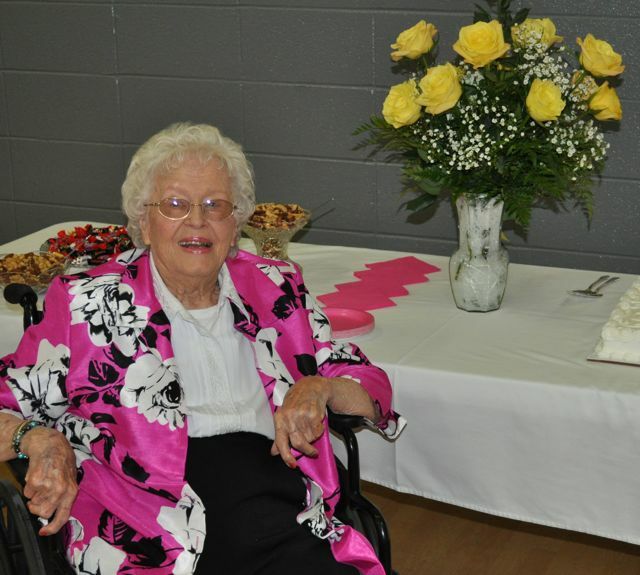 While we were in Monett, another problem raised its ugly head. 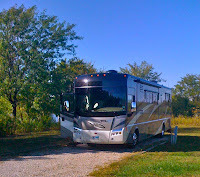 So, we stopped back in Paola on Monday after the birthday party and made our home in this spacious site at nearby Hillsdale Lake State Park. On Tuesday, the good folks at A-Z installed the least expensive of two potentially failing parts. 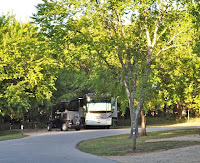 After the installation, we spent the night at a city campground at Paola's Lake Miola. 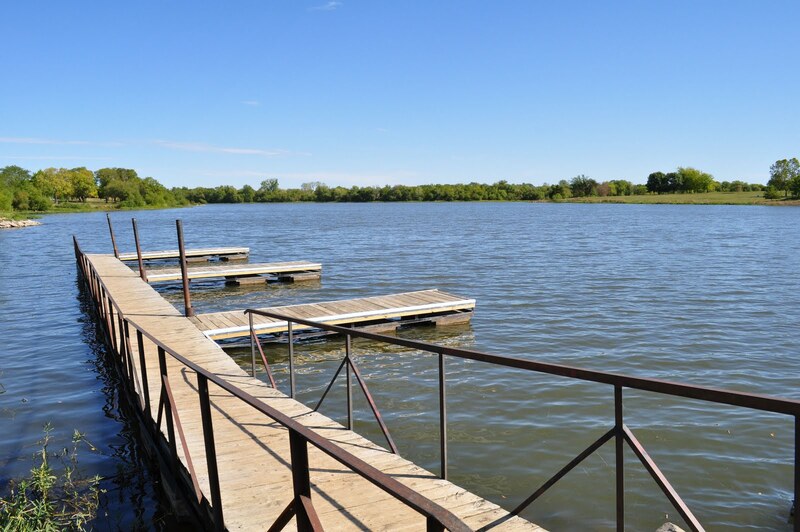 This 200-acre lake was constructed in the 1950s and served as the city's primary source of water. Today the campground has definitely seen better days. But, on this sunny afternoon we had the place to ourselves and enjoyed the view. We used our time here to test out the newly installed part and discovered it had not solved our problem. So, it was back to A-Z on Wednesday to order the big, bad (expensive) part that would finish the job. While we waited for that part to arrive, we made our return trip to Lake Melvern to meet up with friends Sandy and John. Today we returned to A-Z and waited for an inspector from our extended warranty company to approve the replacement of this big ol' bad boy: the cooling unit on our refrigerator. This is the defective unit after it was removed from the back of the fridge. It took about four hours for A-Z to work their magic. They returned Bullwinkle to us with just enough daylight left for us to get out of town. We'd already spent plenty of time in this friendly little town! 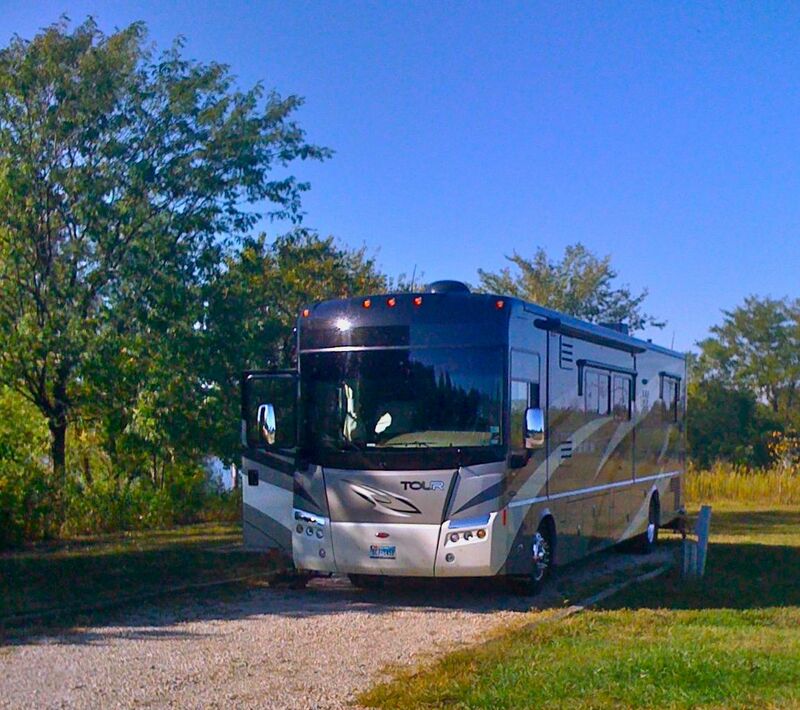 Tonight, we're resting comfortably in a beautiful site at another Corps of Engineers park on beautiful Clinton Lake. We're oh so happy to report that our rehabilitated refrigerator is cooling just fine. Here's hoping it'll be awhile before we find ourselves back in Paola. A long while!!! 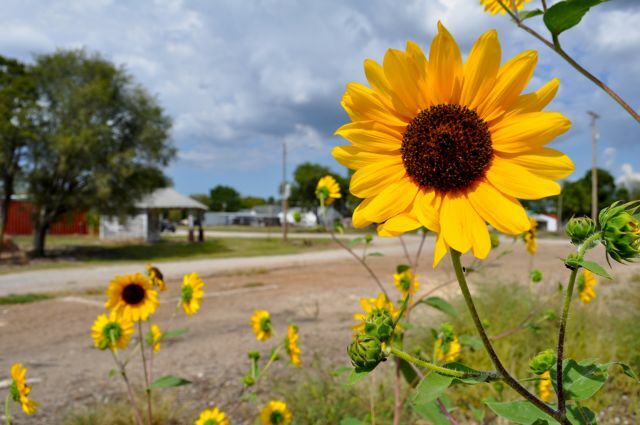 As Kansas natives, we grew up being well aware that the Sunflower State is dotted with several lakes developed by the U.S. Army Corps of Engineers. That said, we had never gone "camping" at any of these scenic parks. These days, we're doing our best to make up for lost time. Twice in the last few weeks we've made a stop at Lake Melvern. Here's our "lake place" we called home two weeks ago. 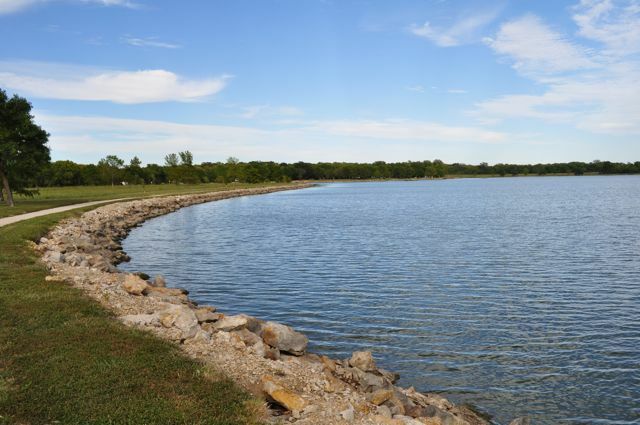 Lake Melvern is located about halfway between Emporia and Ottawa, just a few miles north of I-35. 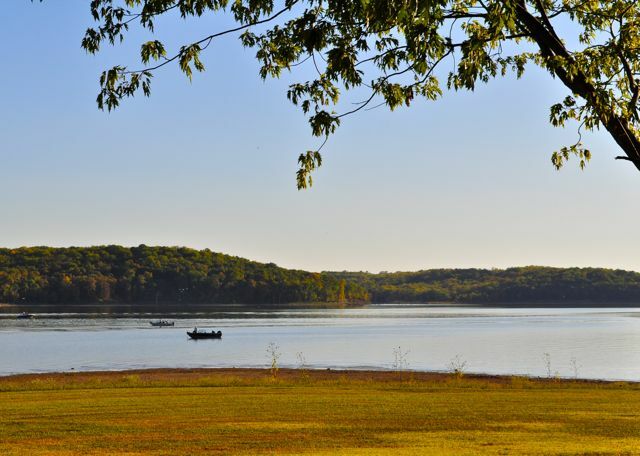 The 7,000-acre lake is surrounded by 18,000-acres of land that features swimming beaches, hiking and biking trails and six campgrounds. 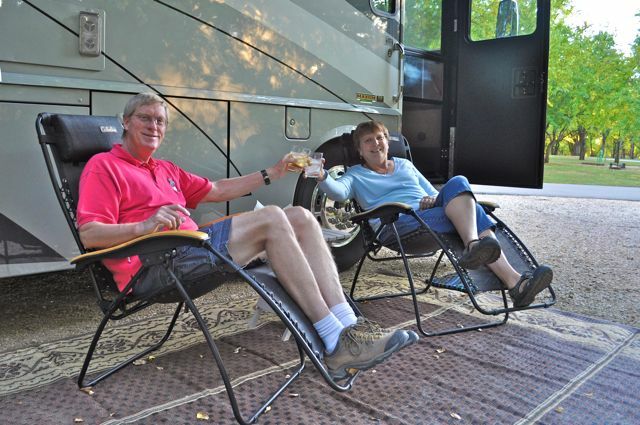 Outlet Park Campground offers 150 campsites that surround the 90-acre River Pond. 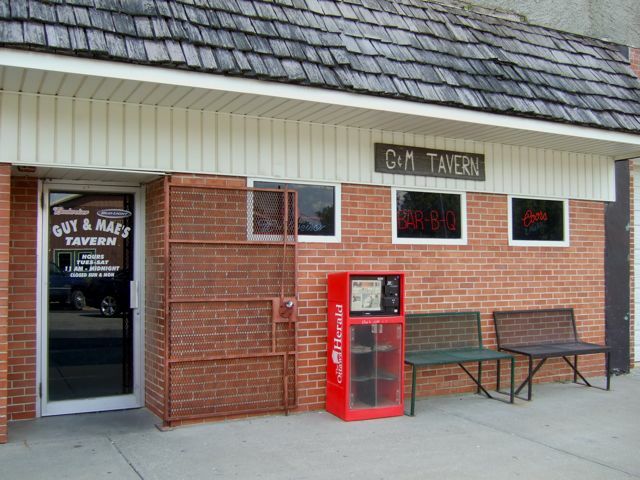 A "can't miss" stop for visitors to Melvern is Guy and Mae's Tavern in nearby Williamsburg. As we learned during our recent visit to Abilene, this infamous barbeque joint is one of the 8 Wonders of Kansas Cuisine. 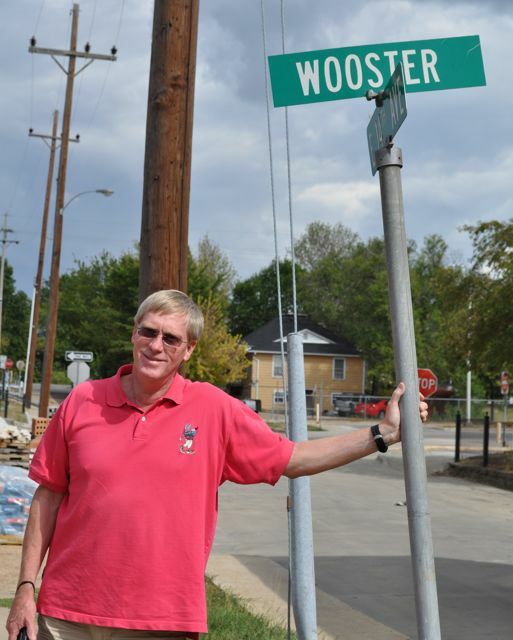 Amazingly, these two Kansas natives had never made it to this unassuming but noteworthy spot. Now, we can say we've been there twice! 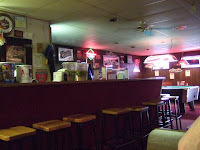 Guy and Mae opened this hometown bar in 1973. While Guy developed his mastery of barbeque ribs, Mae invented her trademark sauce. They put the two together and the family has been serving up slabs of ribs wrapped in foil since. During our first visit, we enjoyed a couple of cold beers on a warm day while we waited for our slab and sides. I meant to take a picture of the tasty ribs, but they were gone before we knew it! Trust us when we tell you: Guy and Mae's is definitely worth a stop. When we returned to Lake Melvern yesterday, guess who pulled in behind us? The Moose is there on the right, and that's the Mothership on the left. Here's the real reason we came back to Melvern. Our dear friends Sandy and John are piloting the Mothership to their new home in Arizona. They've stopped here for a couple of nights to rest and meet up. It was great to see them both, and their cute little dog Koko, too! We wish them safe travels and good times in their new home. 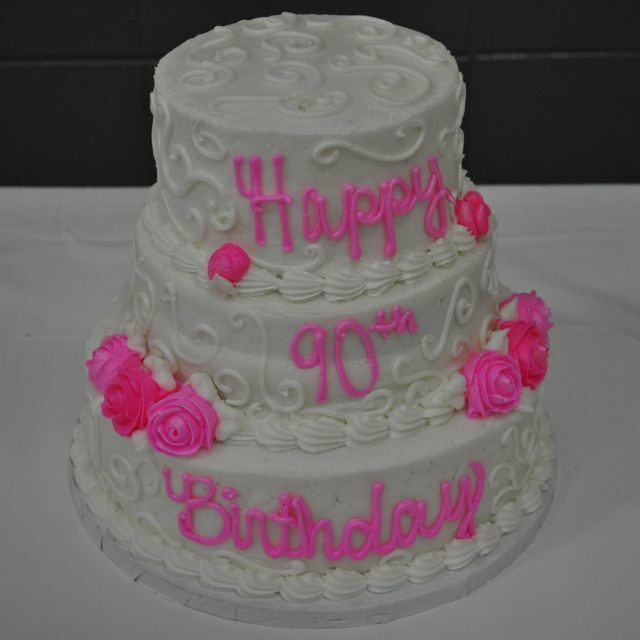 Today we are in Monett, Missouri to attend a really big birthday party. 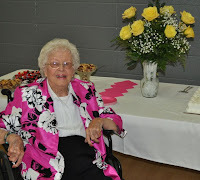 Paul's Aunt Martha (or Marty, as she's known in these parts) turned 90 years young this week. This afternoon, her children held a wonderful reception to celebrate this very special occasion. Doesn't the Birthday Girl look lovely? If you're a member of Paul's clan, you know what's wrong with this photo. We'll go ahead and let the rest of you in on this joke. 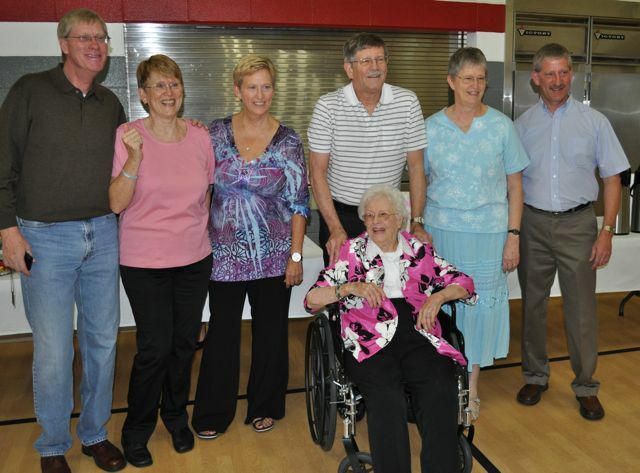 When Aunt Martha's six children gathered for a pre-party family photo, Cousin Scott was missing. So, Paul stepped in as a smiling substitute. Actually, Paul does bear more than a passing resemblance to his temporarily missing cousin. In fact, several party attendees called him Scott! We've had great fun hanging in Monett all week. So, we were fortunate enough to participate in several pre-party festivities. 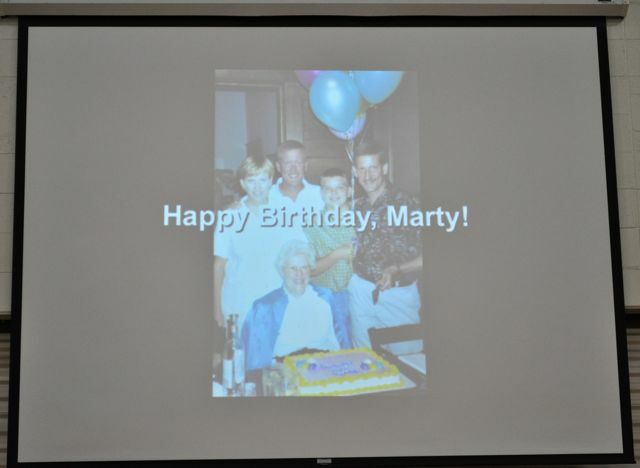 In our spare time this week, we put together a presentation for the party that contained a collection of pictures and music that celebrated Martha's (er, I mean, Marty's) wonderful life. It seemed like the entire town turned out for this afternoon's party. 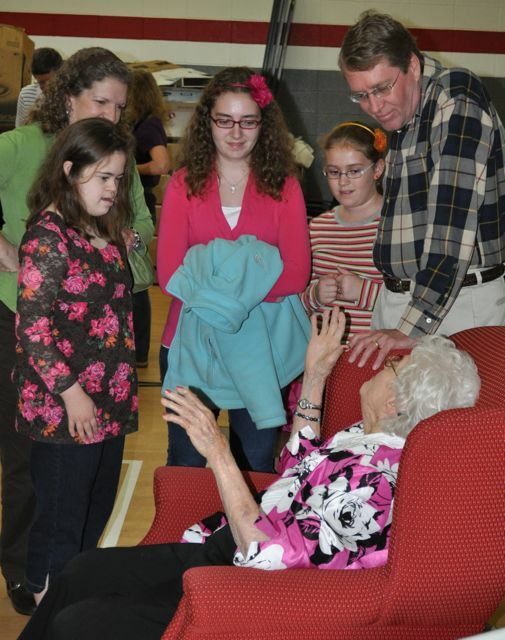 Martha enjoyed visiting with each and every guest, including Paul's brother and his family. A few people called Paul's brother by their cousins' names, too! 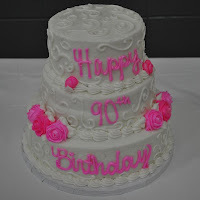 It was a wonderful party. A good time was had by all. 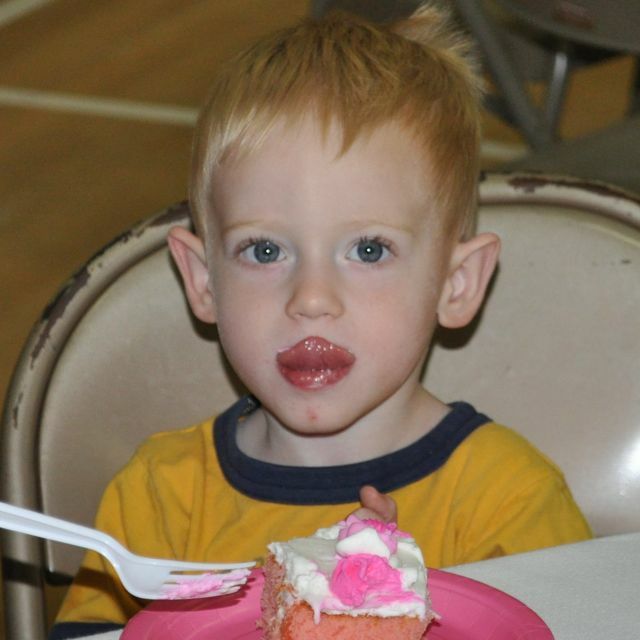 And, by the looks of that cute little face, the birthday cake was especially tasty! After a short stop in Kansas City over the Labor Day weekend, we made our way south to Paola for our much-anticipated air conditioner repair. The good folks at A-Z Mobile RV Repair made quick work of the job, so we found ourselves with a couple of extra days to spare. We decided to spend them at Melvern Lake, which is located just north of I-35, between Ottawa and Emporia. 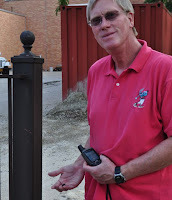 Today we decided to take a short day trip to nearby Emporia to locate an important piece of Paul's family history. Along the way on this gorgeous day, we stopped in don't-blink-or-you'll-miss-it Olivet to pick up a geocache and take what we think is a mighty fine shot of the state flower: the sunflower. Now, that's Kansas! 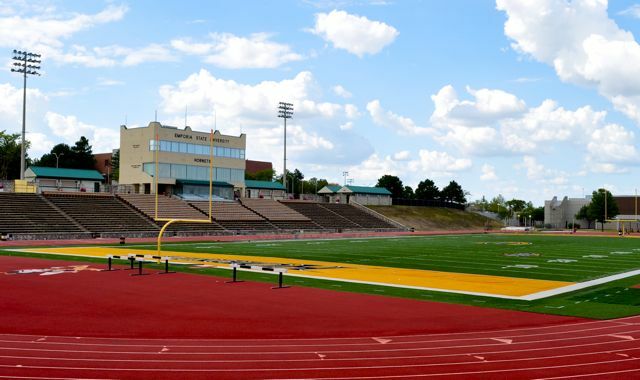 We checked the Emporia State University football schedule before we left. On this September Saturday, the Hornets are playing an away game. 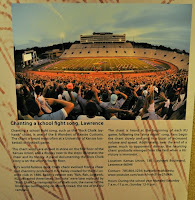 So, the campus and the football field were very quiet during our visit. 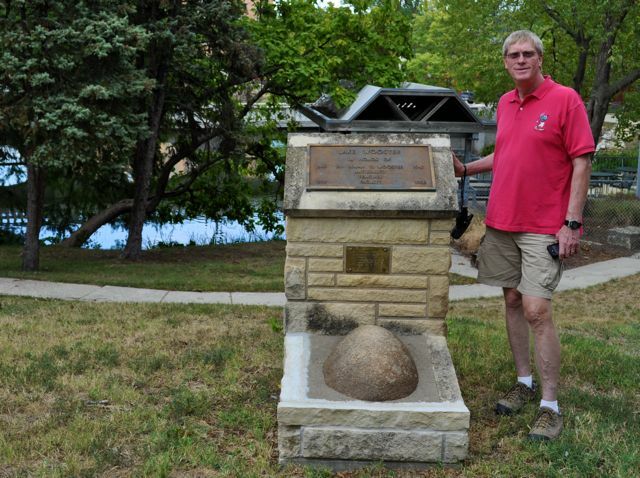 Paul's great grandfather was a professor of Geology at ESU for more than 40 years. 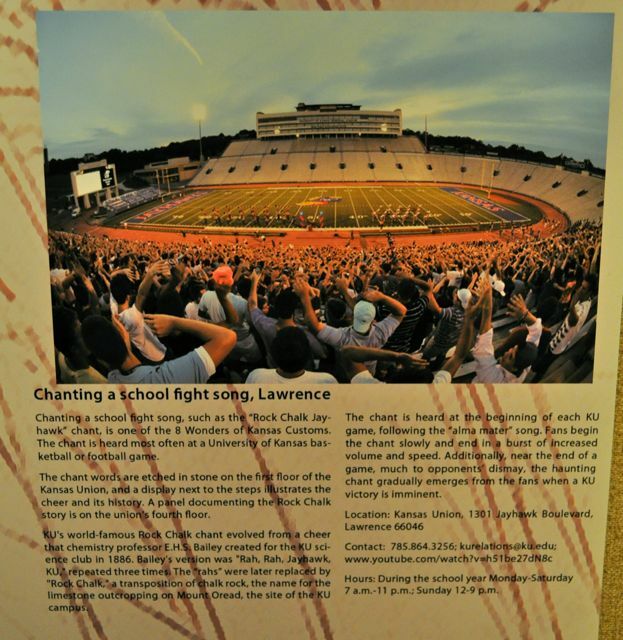 You can find his name in several spots around campus. 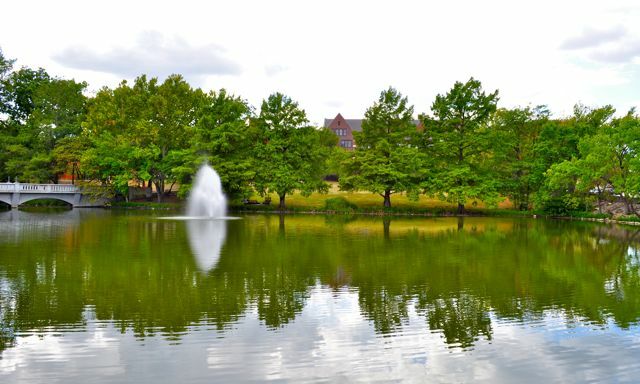 Wooster Lake and Wooster Bridge, also named after Great Grandpa, provide a beautiful and peaceful setting near the center of campus. Wooster Rock is embedded in concrete at the base of a monument just up a hill from the lake. Great Grandpa discovered this boulder with five planed sides and glacial markings in the 1880s near Eureka, Kansas, which was significantly farther south than any previously known penetration of glaciers in Kansas. The boulder sat in his classroom for years, and Great Grandpa was known to challenge ESU's biggest, strongest athletes to pick up the little thing. It weighs more than 400 pounds! On the east side of the lake, we made a very special geocache find. 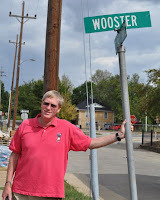 The little "micro" cache in Paul's right hand is named Wooster Lake. The cache description offers a bit of history about Great Grandpa. Emporia is also home to one of the 8 Wonders of Kansas People: William Allen White. Born in Emporia, William Allen White became an editorial writer for The Kansas City Star in 1892. 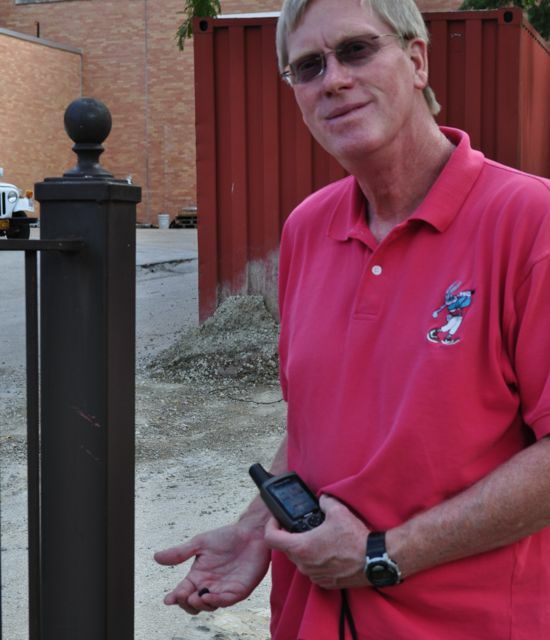 Three years later he bought his old hometown newspaper, the Emporia Gazette and became its editor. Throughout his career as a newspaper editor, author and politician, White gained a reputation as a spokesman for middle America. Today, the School of Library and Information Management at ESU bears his name. 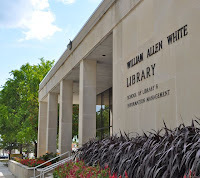 As graduates of the William Allen White School of Journalism, we were eager to check out another local site that commemorates the life and times of this famous Kansan. 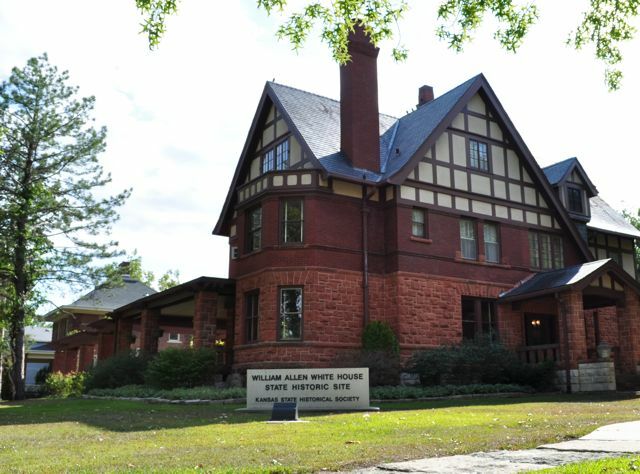 The William Allen White Home is a State Historic Site. 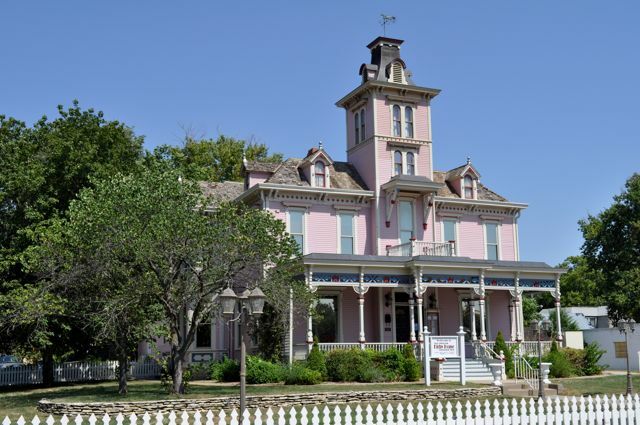 Built in 1888, the house was known as Red Rocks. 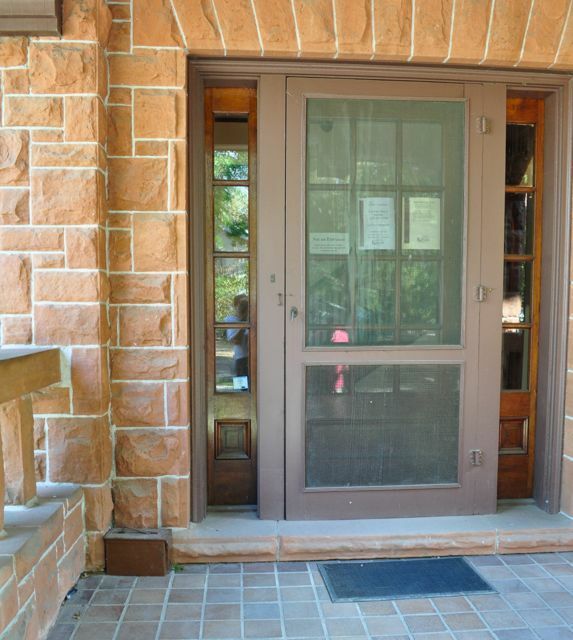 The red sandstone covering the first floor is believed to have been quarried in Red Rock Canyon in Colorado Springs. White purchased the home in 1901. 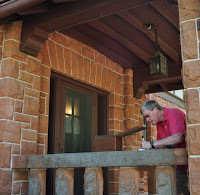 In 1915, White wrote his friend Frank Lloyd Wright and asked him to "do over" the house. Six years later, the former Queen Anne was transformed to a Tudor Revival. White lived in this beautiful home until his death in 1944. During that time, the White family hosted several U.S. Presidents and many prominent Americans. If those walls could talk! While visiting the White house, we checked to see if there were any geocaches nearby. It turns out there was one sitting on the North porch. Can you spot the cache? Paul made quick work of this historic find at this very stately home. We found a total of five geocaches on our day trip. 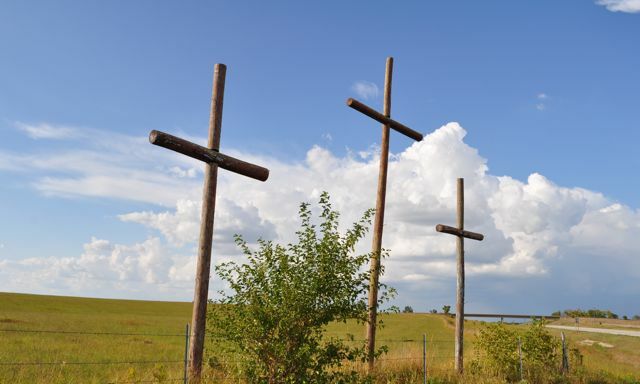 The last was at the base of this picturesque trinity of crosses where the road to Lake Melvern meets the interstate. 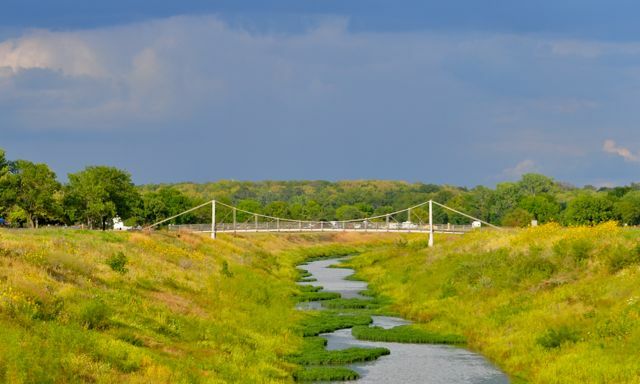 Five caches + Exploring bits of family and state history in our native Kansas = One fun day! Our drive across eastern Colorado and western Kansas was uneventful. Our overnight in Ellis, Kansas was as peaceful as could be. 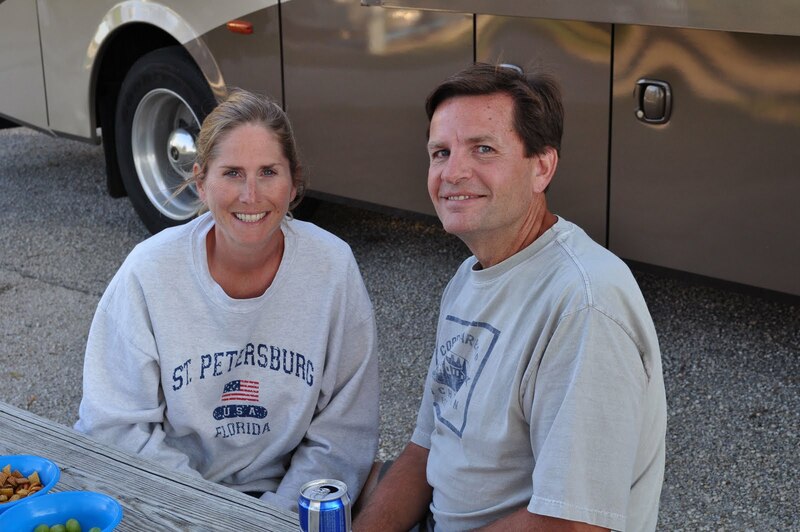 (We simply love that campground!) From Ellis we made our way along very familiar I-70 to Salina to rest up for a couple of days. Paul's sister and brother-in-law took a break from work today and, despite the scorching 100-plus degree heat, the four of us made a trip to nearby Abilene, which is the boyhood home of President Dwight D. Eisenhower. Before Dwight D. Eisenhower was elected the 34th President of the United States, he was a five-star general in the U.S. Army. He resigned his commission as General of the Army before his inauguration, but it was reinstated after he left office. 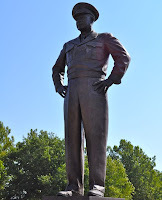 Between the two prestigious positions, Eisenhower said he always thought of himself as a general. 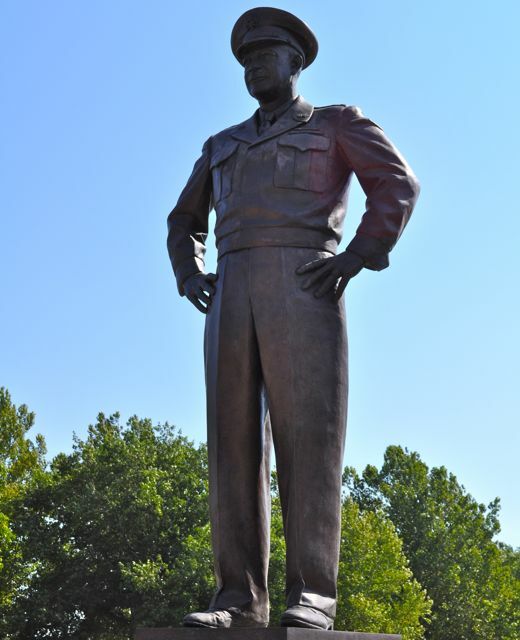 So, it seems fitting that this commanding sculpture of the general stands guard over the museum campus. Like Abilene, the Eisenhower campus is quiet and peaceful. 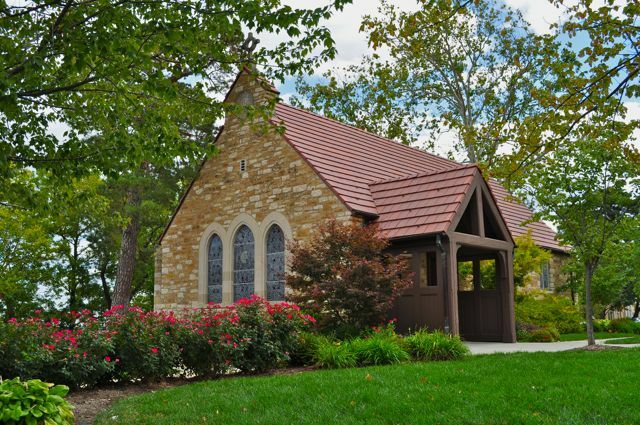 Eisenhower and his wife Mamie are buried in the Place of Meditation on the campus, behind the Visitors Center. 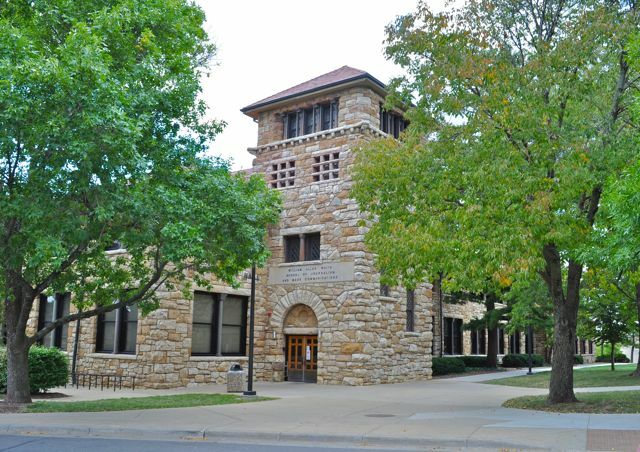 All of the modern buildings on the campus are constructive of native Kansas limestone. 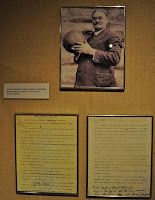 The Presidential Library houses an archive of documents and audio-visual materials spanning the Eisenhower's life. This has been a record-breaking year at the library, which has been visited by more than 800 scholars who have come here to conduct research. The Library's second floor houses temporary exhibits. The current installation highlights the Wonders of Kansas. 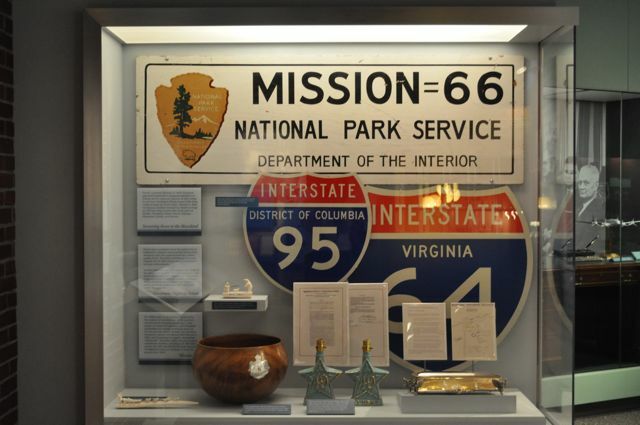 (It just so happens that the Eisenhower Library and Museum is one of the top eight wonders!) 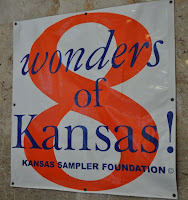 As native Kansans, we found this exhibit fun and informative. 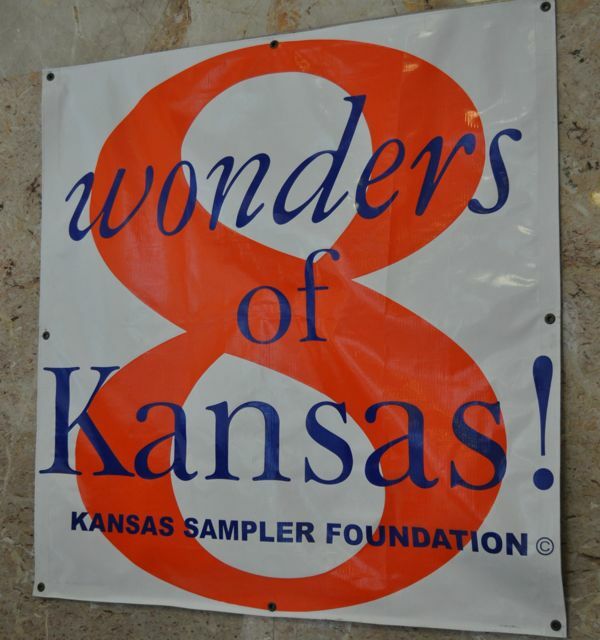 The 8 Wonders of Kansas project was designed "to help the world get to know Kansas" by selecting eight of the state's best art, architecture, commerce, cuisine, customs, geography, history and people from 218 finalists. One of the top eight Kansas customs is Chanting a School Fight Song in (You guessed it.) Lawrence. 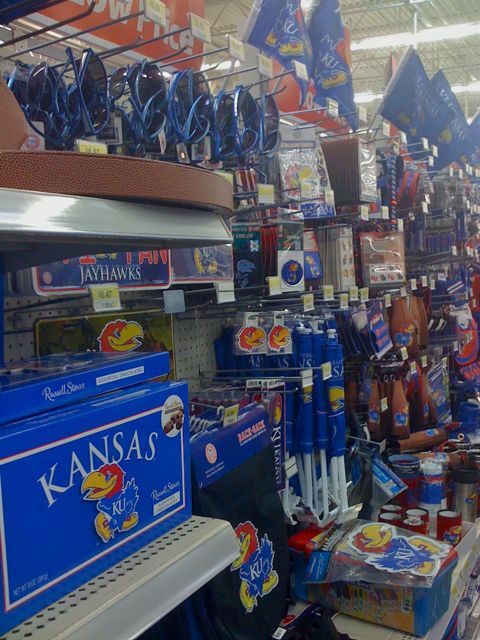 Rock Chalk! 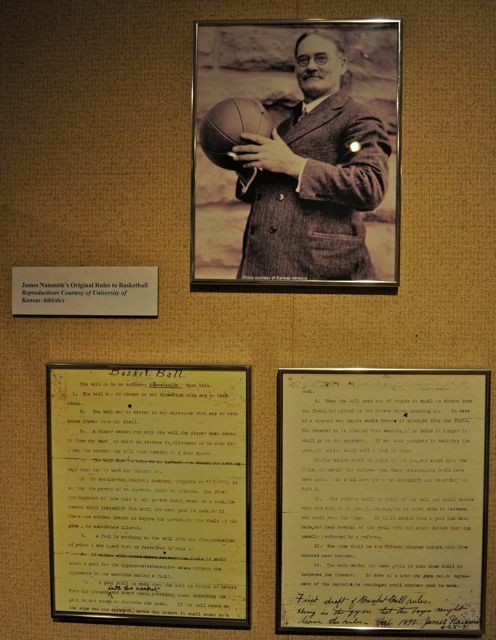 Speaking of Jayhawks, one of the eight Wonders of People in Kansas is James Naismith, who started the basketball program at our beloved alma mater right after he invented the game. 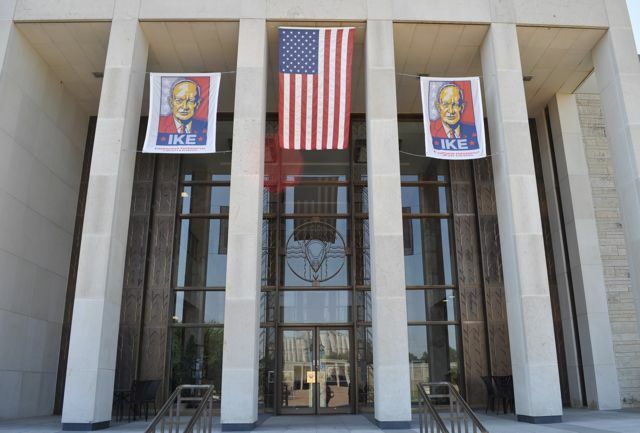 Across from the Eisenhower Presidential Library sits the Eisenhower Museum. 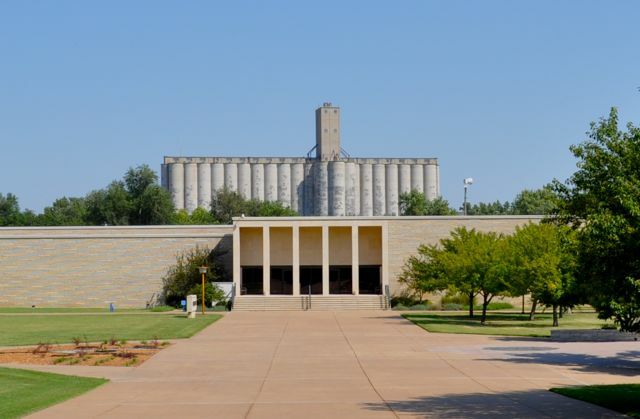 We've been to several Presidential Libraries in our travels, and we've yet to see one in the shadow of a grain elevator! 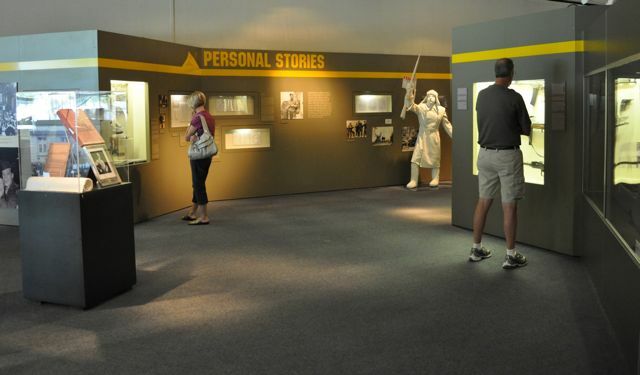 The museum houses several permanent galleries, including a military gallery, which chronicles the history of World War II. This area of the gallery featured personal accounts of the war as written in letters and diaries of soldiers and family members. 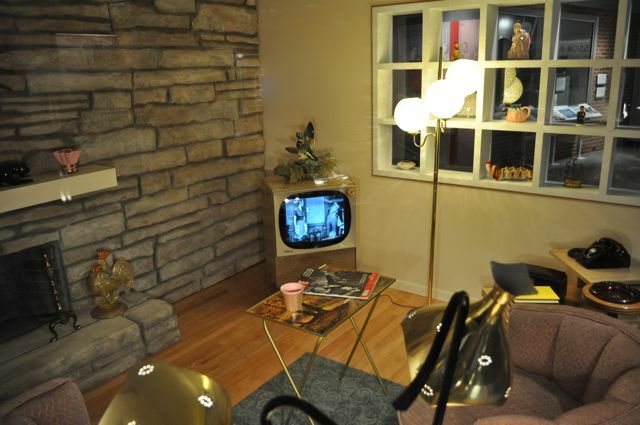 This display featured the living room of a typical home in the booming suburbs of 1950's America. Televisions, telephones and home decor have come a long way in the last 50 years! Eisenhower enacted the Federal-Aid Highway Act of 1956, which paved the way (pardon the pun) for the Interstate Highway System. As frequent travelers on this nationwide span of more than 46,000 miles of highway, we appreciate President Eisenhower's efforts. One of the things we enjoy when we visit museums like this is seeing replicas of Presidential offices. 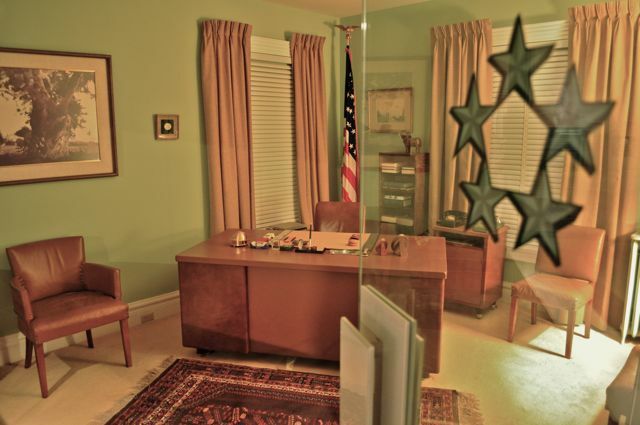 While other museums feature replicas of a President's Oval Office, the Eisenhower Museum displays a replica of the retired general's office in the first couple's first permanent home in Gettysburg, PA. 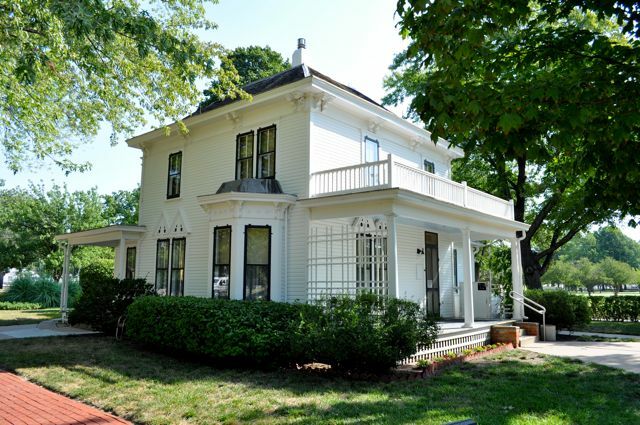 The library and museum are built around Eisenhower's childhood home, a white clapboard with a cedar shingle roof that is typical for a 19th century Midwestern home. The Eisenhower family resided here from 1898 until 1946. Today the house is furnished to reflect the decades the Eisenhower's lived here. 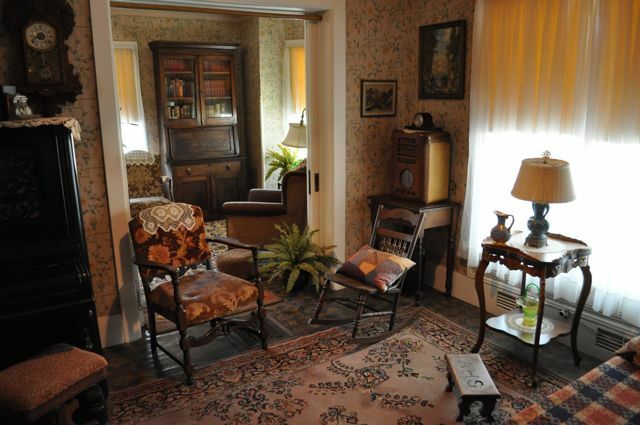 This room is the back parlor, which was used by the family on a daily basis. These days, it would probably be referred to as a family room. After our tour, we enjoyed lunch at Kirby House, a lovely restaurant in a restored 1885 mansion near the center of Abilene. And, of course, we made time for a bit of shopping, too. 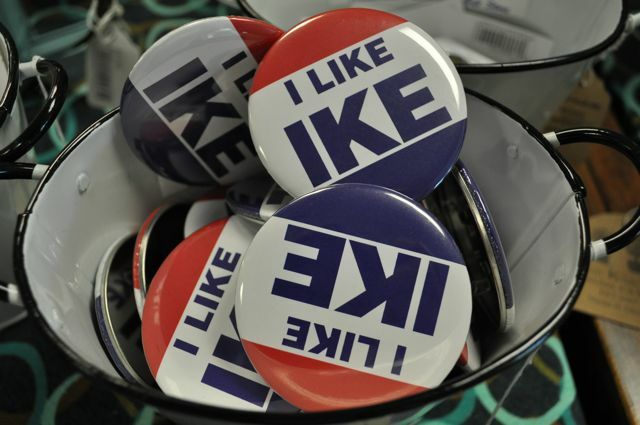 Despite the heat, we enjoyed our day in Ike's hometown. Many thanks to Susan and Doug for making it a great day!